Josh Bailey is not going to win any “most popular Islander” awards, ever. With middling and often uninspired play over the course of his career, it’s hard to find a fan that would ardently stick up for him. 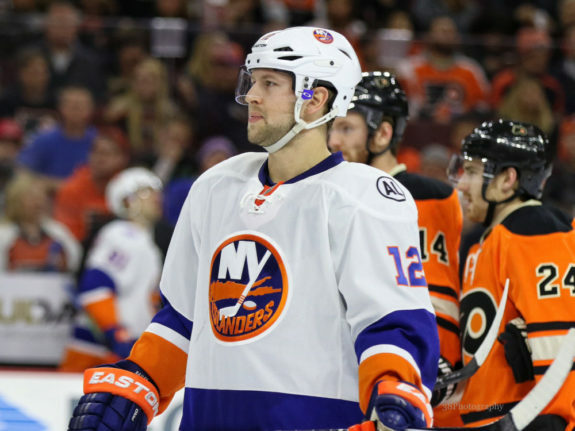 Although on the Isles at the same time as other players the likes of John Tavares, Kyle Okposo, Frans Nielsen and Travis Hamonic, Bailey was never a part of the youth that grew and contributed to the Islanders’ successes. At this point in his New York Islanders career, he’s got two years left on his contract and needs to make team brass happy enough to keep him around past that. With little value to the rest of the NHL and no real evidence that he’ll be more than a third-liner with potential, Bailey is running out of time. The question now is can Bailey be a real part of the team’s core if given an opportunity? Much like Brock Nelson, Bailey was awful over the past 25 games of the season, scoring just two goals and ending the season with 12 goals and 32 points. Spending just about 15 percent of his even strength ice-time with John Tavares, Bailey was sandwiched on the second and third lines for most of the season. Despite four power play goals, Bailey was never a fixture with the man-advantage and was only positioned there when other players faltered. Regardless of where the Islanders drafted him and their one-time confidence in his future, it all seems gone at this point. When you think of players that the Isles could leave unprotected in the expansion draft next season, Bailey immediately comes to mind. Bailey has to shoot more, even in his current place on the depth chart. His career high is 140 shots and although he has a quality release and the speed and hustle to get himself in prime shooting areas, evidenced by his two-goal game against the Lightning in last year’s playoffs, he’s just not consistent at it to be a star. He’s never been. Rushed to the NHL at 18, Bailey never got the AHL seasoning some many younger first-round picks get. Not the pedigree on offense or defense that you’d expect from a top-round selection either, Bailey needs a real opportunity. Not a handful of games tryout with Tavares or Ryan Strome. Bailey needs the trust of the coaching staff to play in all situations. But considering his past, why would he? The only way that happens is if PA Parenteau isn’t up to being the first-liner the Isles need him to be. In season’s past, New York was forced to provide linemates for their captain by committee and Bailey always gets a crack at creating chemistry with one of the most dynamic players in the NHL. Thrust into a great situation, Bailey has to prove himself. If he gets an opportunity to play top minutes, this is the last time. Make or break time. Simply put, Bailey needs to come to camp in the best shape of his career and grittier than ever. Regardless of who he plays with, Bailey is a lock for 10 goals and 20 assists, making him a depth player, at best. Not exactly worth the $7.7 million he’s owed over the next two seasons, Bailey, who will also have a few youngsters vying for roster spots this camp as well, my find himself disposable. Still, with a roster spot, Bailey needs to become a player he’s never proven he can be.